Michael at TAG is an amazing architect! He put what was in our heads, our crayon drawings into a real blueprint! Mike & Lani have been so easy and fun to work with in designing our dream home. They are absolutely fabulous people, welcoming us as if we were ohana. We will be sad when we don't get to see them or talk to them anymore. They are experts in their field and just an absolute joy to work with. 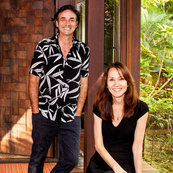 We are so grateful to have found them and they are making our Kauai dream home a reality!